Colouring your hair is a great way to get new look and add some pizzazz to your style. However before you pick up that box of colour or make that appointment at the salon you need to decide exactly which methods you would use to achieve your new look. There are basically seven different methods utilised to dye hair. These methods range from simple and temporary to complex and permanent and the one you choose will ultimately depend on the look you are trying to achieve, your current hair condition, and the time you want to invest. The least expensive, least time-consuming, and shortest lasting hair dyeing method is temporary hair colour. Temporary hair colour is formulated to coat the hair cuticle, but not penetrate it, and deposit superficial colour on the hair. This method is great for one-night hair colour changes, experimenting with new colours, or adding depth and brightness to your natural hair colour. To use this method you simply choose a fun colour, apply it per the product's instructions, and wash it at with one or two shampoos when you are ready to go back to your natural look. If you like the look of a temporary hair colour and wish it would last a little longer but are not quite ready to commit to permanent change then a semi-permanent hair dyeing method may be for you. This method deposits colour a little deeper than temporary formulas, the colour actually penetrates the cuticle of the hair, and can be washed away in 5 to 7 shampoos. 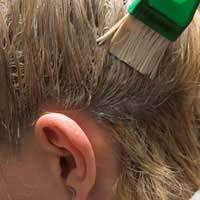 Although this method is not recommended for full hair dyeing or complete grey hair coverage, it will add highlights to natural hair colour, cover some grey, and add extra depth to dull colours. In order to take your hair dyeing one step further than semi-permanent you can try a semi-permanent colouring method. This method offers better grey hair coverage, lasts longer than other temporary colours- up to 20 shampoos, and allows you to choose a darker or lighter colour change than other temporary methods. Although the colour in this method is deposited deeper in the hair strand- between the cuticle and the cortex- it is still not as damaging to hair as permanent hair colour or dyes. If you really love your new colour and want it to last the best method for hair dyeing is permanent colour. In this method the dyes are deposited into the cortex of the hair after the cuticle has been chemically opened. This deep penetration allows the colour to completely cover grey hair, offer consistent shading throughout the hair, and keep the colour from fading for 4 to 6 weeks. The disadvantages to this hair dyeing method, however, are that it is completely permanent so you must really like the colour, and as new hair grows in, the difference in shade is very noticeable. The first four methods of hair dyeing rely on achieving all over hair colour change. The next two methods- lowlights and highlights- concentrate on only adding colour to certain areas of the hair. The lowlights hair dyeing method focuses on depositing areas of darker, or deeper colour throughout the hair. These darker sections are used to bring depth to natural hair colour or hide areas of grey more naturally. Although the change is subtler the results are still permanent. The highlighting method focuses on depositing bringing lighter, brighter areas of colour to the natural hair shade. In this process certain sections of hair are stripped of colour or lightened to achieve a permanent sun-kissed look. Highlights also add shine and brilliance to dull, one-colour hair. The last hair dyeing method- double process colouring- is used when individuals with dark hair want to go over four shades lighter in colour. In this method the cuticle is opened and natural colour is first removed from the hair's cortex. Next, a new, lighter shade is deposited into the cortex for permanent hair lightening. Since this method of hair dyeing can be very damaging to your hair it should only be attempted by a professional stylists.